After many weeks of testing, Google finally updated the homepage and search results pages. The changes aren't so radical, but they're still significant: there's a black navigation bar, two updated buttons for "Google Search" and "I'm Feeling Lucky", while the corporate links are moved to the bottom of the page. 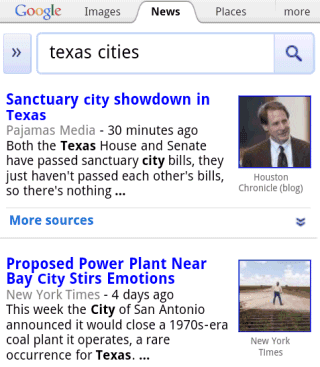 Google says that this is just a small step from a redesign that will affect many other services. "The new Google experience that we've begun working toward is founded on three key design principles: focus, elasticity and effortlessness. (...) With the design changes in the coming weeks and months, we're bringing forward the stuff that matters to you and getting all the other clutter out of your way. Even simple changes, like using bolder colors for actionable buttons or hiding navigation buttons until they're actually needed, can help you better focus on only what you need at the moment." The new navigation bar seems to draw unnecessary attention and some find it distracting, so it's not clear how it helps you "better focus on only what you need at the moment". Google's black bar is used in Google+, so it's likely that it will include other social features in the future. While the interface continues to be simple and utilitarian, Google wants to use HTML5, WebGL and other new technologies to make Google's apps more powerful and better looking. "Our design philosophy is to combine power with simplicity. We want to keep our look simple and clean, but behind the seemingly simple design, use new technologies like HTML5, WebGL and the latest, fastest browsers to make sure you have all the power of the web behind you," explains Google. It's interesting to see that Google Maps added the label-less blue button from Google+, but Google Search still uses the regular button. My brother can see the new black bar on many of the apps but I am yet to see it. I guess it will just take time. The new mobile version takes up far more room than I'd like. The top banner though easy to touch what you want is very large, in reader for example the extra space taken up by it removes about 3 feeds from the fold. I love the redesigned google maps! It looks a lot like MS "metro", and that's a good thing (I love metro as well). The top bar is cute, but I agree that it pops too much right now. In Google Maps, popup bubbles are not rounded anymore and it's better, much more integrated with the rest of the layout. The search interface now looks absolutely bloody hideous. 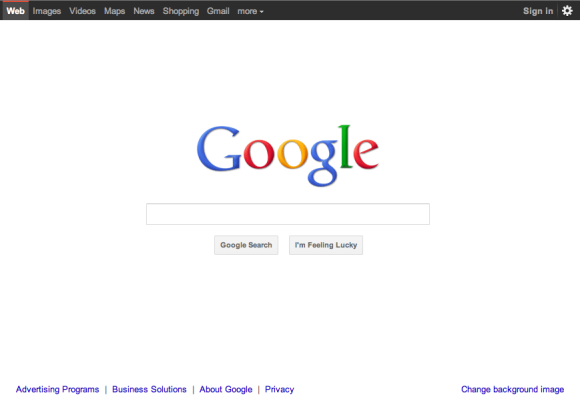 I like the new design of the google homepage.. Very good compared to older home page.. I got new interface for images search. 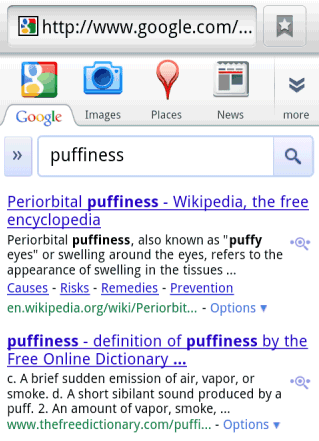 But web search is still showing old one. This black navigation bar is the ugliest thing I have ever seen. I make me want to stop use Google! It is that bad! How can you go from white to black? At least let the user choose the color! Has this been a consensus driven decision at Google? Must be. Ask Steve J. what he thinks about it. I think he would puke! Light grey font over a black background is one of the most unreadable combinations (see color theory). It's strange for Google to do such an error. Get rid of that black bar please Google. I like the new changes. Also think the black bar looks great. Waiting for some sharing of the data which comes with these modification. And I know people will always o oppose to change. Black bar is disgusting! Please remove! At least give us the option to accept or to modify it to our preferred color! I very much disliked this stupid change from Google and I don't know what to except tomorrow? A black background with yellow text with animated google logo and pacman sound? The Blue Button is used on the search results, just not the homepage for me. Prior to today top "bar" had blue text with luminosity 101 (base 10) on a white background. Now it's gray text with luminosity 160 on a black background. So there is less contrast now than before. The newer interface is harder to read. Kudos to the design team at Google! Also, text is/was aliased in both cases, which I think makes the lesser contrast display (the new Google) more difficult to scan. CORRECTION: Actually there is more contrast now, but I picked the brightest pixel when doing the assessment. Because the text is aliased, it has an average luminosity that is much darker, and hence, less contrast-y than the blue text on white. Contrast or no contrast, it remains ugly! I like it! I didn't at first glance, but especially if you have a darker background image for your google.com page, it looks really nice. No more blinding whiteness. Google maps especially looks nicer. The BLACK bar is just a joke, right? Like an April Fool's deal? So far the feedback is "googal" opposed, 0 in favor. Who in their right mind would design a distracting SOLID BLACK bar that gobbles up half an inch of screen real estate and is redundant with 2-3 other interface elements? Or, are you consulting with Microsoft on how to waste as much screen real estate as possible? Hopefully there are some controls forthcoming to turn off the bar, or at least make it transparent - something. The black bar is plain ugly... sorry. It should be configurable to get rid of it. Dont like it one bit. The hole search area is thrown way to the fare left. Im actually leaning a tad bit to left just to read my searchs. Searchs need to be more centered. I like the overall look of the new design, it's simple and effective. But I don't like, I hate the new black bar at the top. It just doesn't look like it's a Google bar and the old one had more contrast and fitted better. Every time I go to search on Google I see that black bar on top which really blacked me out. I can't help it, it bothers me a lot! Please, remove it! Why the monochromatic icons down the left side of the search results, why remove the colours which aid in rapidly distinguishing the icons for quick selection. Itunes did the same thing about 6 months ago and I hated that, another example of form taking precedent over function. Hate it. Distracting and doesn't add value. Give me themes so I can make it look good like the old version and I will stop complaining. The black bar doesn't bother me, but I would love to be able to centre the search results! You can default to the classic centred home page *rather than the Google Instant screen), but as soon as you get any results everything leaps over to the left leaving an enormous blank area on the right and it stays there unless you go back to the home page. Loving the new design, can't believe it took this long! I search a lot, and thing I dislike is that link is located just below title of a webpage. It should be located below description, not before it. The color scheme and also the style of the top bar evokes strongly (if not is identical to) the GTK Theme "elegant brit"!!! Black bar remains a big distraction while searching on google. I can't get used to it. Please give option to at least modify it. I have come to love the new interface, looks very neat and clean.